Rottenlead: 0.6 Grunts Rules released. It has been a bit of a major slog over the last week but v0.6 is now in PDF form and on the yahoo group for review. I am not sure if I now love it or hate it after spending so many hours tweaking and significant effort designing and laying out overview artwork to explain how the game works. Tonight I have lost the ability to write! 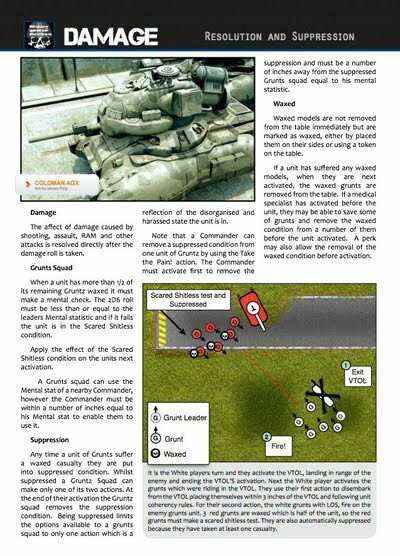 Please note the final release of Gruntz is now available for PDF download. More of the licensed art is now creeping into the rules and more is also due. It is now up in the yahoo group for download. As before any playtesters are welcome and any ideas for rules or feedback are gratefully received and enthusiastically blended with the concepts in Grunts. Clarification on command modules on vehicles that benefit grunts units - Something to do with those excellent command tanks from GZG. 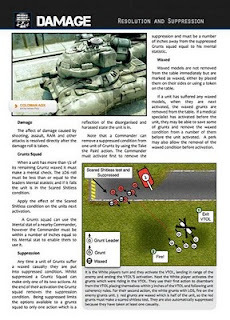 Refined commander actions to allow him to remove suppression of nearby grunts using"Feel the Pain" or assign them an extra "Push Move". Drop off and dust off rules for VTOL and other transport units. Detailed bunker and building assault rules. Get Mouse-Holing! Explanation of transport units - what they can carry and deliver on the battlefield. Many mini graphical overviews of game situations to make learning the rules easier.